Whether you're stocking up on strawberries and cream or perfecting your backspin in preparation for Wimbledon 2017, expect nothing less than to eat, sleep and breathe this spectacularly British sport over the next few weeks. You may not have been lucky enough to bag a courtside seat this year, but that doesn't mean you can't be in on the action elsewhere - we've highlighted the top 7 tennis holidays so you can give your racket a whirl without the rainy weather! Spain's southernmost region oozes traditional culture, with pretty pueblo blancos, gorgeous sandy beaches, fairytale castles and colourful flamenco to offer. Andalucia boasts popular beach resorts including Costa de Almeria, Costa de la Luz - and most famously - Costa del Sol, each of which serve up an entierly different atmosphere, so you can cover laid-back, lively and low-key all at once. If you're searching for a great place to practice your swing, Andalucia Playa is the perfect venue. This 5-star beachfront hotel offers a 15 hour intensive tennis programme on its clay and and hard courts, making it a fantastic accommodation option if you're serious about sport - but don't worry, once you've worked up a sweat you can cool off in the swimming pool or unwind in the Thai-Zen spa. We have plenty more fantastic hotels in Spain so you can soak up the Mediterranean sunshine from £165pp! Marbella is another Spanish delight that's doing it for the tennis lovers. Once you've relaxed on Bounty Beach, browsed the boutiques in nearby Puerto Banus and indulged delicious churros in beautiful Orange Square, pick up your trainers and head to Puente Romano. This luxury hotel is located in the heart of Marbella's Golden Mile and has been crowned as one of the most professional tennis clubs in Southern Europe. Within its first class facilities you'll find 10 courts, including a Central Court which can seat up to 2,500 - why watch Andy Murray when you can have your very own audience?! The Algarve, located in the south of Portugal, is one of the most popular beach resort destinations in the world thanks to its mile-long beaches, historic towns, fantastic cuisine and vibrant nightlife. While it's recognised for being a gorgeous golf destination, the Algarve is also a neat spot for a round of tennis too. 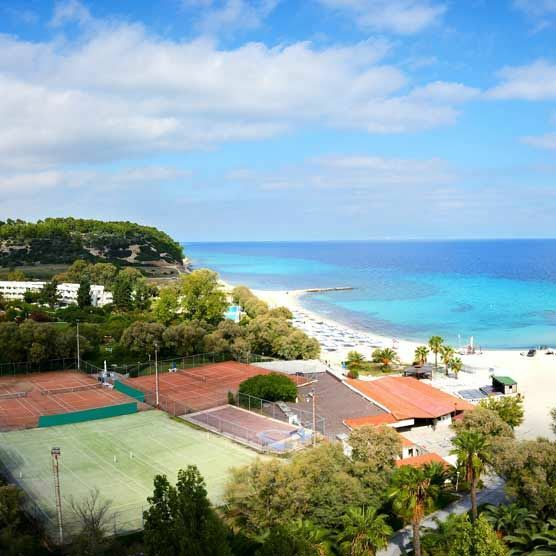 The Pine Cliffs Resort is where you'll find the famous Annabel Croft Tennis Academy, a luxury resort featuring 5 fantastic flood-lit courts and coaching courses provided in spectacular surroundings. If you still need persuading, take a look at our amazing Algarve hotels on offer and bag a getaway to this beach resort today. Alluring volcanic landscapes, long sandy beaches, palm-fringed valleys and charcoal black Lava fields – Lanzarote is certainly a destination of variety. When you're not soaking up the scenery, break a sweat at the seaside resort of Los Jameos Playa - its first-class sports and fitness facilities are admired across the island. You can take part in Tennis Camp Weeks, Junior Tennis Programmes, Social & Competitive Tournaments, Private & Semi-Private Lessons and more, alongside an abundance of other leisure facilities. Take a well-earned break and re-fuel at the terrace buffet or a-la carte restaurant La Tapa. Los Jameos Playa is one of many fantastic resorts for family-friendly holidays, take a look at all of our Lanzarote deals today. Florida truly is a gem among the most popular tennis holiday destinations. The land of the Miami Open welcomes you with its superb tennis infrastructures at IMG Bollettieri Tennis Academy in Bradenton, Academia Sanchez-Casal (campus managed by Emilio Sanchez) in Naples and Rick Macci Tennis Academy in Boca Raton. Enrol yourselves at any of these academies and you're in for the tennis retreat of your dreams! The Boca Raton Resort and Beach Club is a great option if you wish to combine a tennis holiday with a luxurious beach vacation, thanks to the hotel's 12 Har-Tru and 18 Hydro-Grid courts where you can train under professional supervision. Discover more of our fantastic Florida hotel deals and you'll soon be the next Federer! Rugged hills, scenic roads lined with almond and olives, mesmerising turquoise waters - Datça Peninsula is a true Turkish dreamland. Book your stay at the D-Hotel Maris and lace up your trainers for a selection of 50-minute tennis lessons at the world-famous Goran Ivanisevic Tennis School, where the coaches were trained by the legend himself. A hidden gem until two decades ago, this Turkish Island is now among the best tennis tourist hotspots of world. Dreaming of D-Hotel Maris already? Take a look at our holiday deals in Turkey and book your next break today. Mix your favourite Tennis Championship with a little French romance and explore the Roland Garros, in Paris. Scale the famous tower, climb the Arc de Triomphe, dine in at a Picasso favourite and romance at the Musée Rodin once you've made use of the spectacular courts dotted around the city. For those who want an exclusive tennis themed stay, Château Mont-Royal is among the best tennis resorts in Paris. Pick one of our great-value Paris hotels and prepare for an exciting break in the capital city.